Establishing the Knowledge Triangle between Education, Research and Entrepreneurship. There is broad consensus that entrepreneurship enhances an innovative culture in higher education, which in turn results in higher competitiveness. As a result, significant government funding has been allocated to the promotion and development of entrepreneurship in knowledge institutes. However, much of this investment is founded on anecdotal evidence on the causal connection between stimulating entrepreneurship and the impact this has on society. To strengthen the knowledge base, the upcoming DARE seminar aims to discuss the current state of research in the Netherlands on entrepreneurship education, technology transfer and knowledge valorisation. With this we aim to contribute to the knowledge triangle between education, research and entrepreneurship. Theoretical development of entrepreneurship education and the proposed and actual relationship between entrepreneurship education and economic development including: employability, new venture creation, and competitiveness. Evaluating the impact and role of government and industry policies in promoting entrepreneurship. Methodological issues in research on entrepreneurship education and on the impact of knowledge valorisation, the availability and assessment of new data sources, and innovation in research approaches. Best practices of entrepreneurship education and knowledge valorisation, assessed from various stakeholder perspectives. The DARE seminar aims to further develop the submitted research and the program allows for only a selection of papers. Please submit manuscripts in a word-compatible format electronically, before 1 October 2015. Papers will be evaluated by the organising committee and acceptance will be notified by email before 15 October. For submissions and questions please contact us at info@dutchce.nl. We are very delighted to receive your high quality work and look forward to an invigorating DARE event. Have you recently finished your PhD Thesis in entrepreneurship and the small business field and are now wondering what’s coming next? Do you want to learn more about publishing your research? Do you need advice on your latest research proposal or an article you are working on? Do you want to set up (international) research collaborations, and are looking for collaborators? Do you want to give a fillip to your career opting for the PDWW AWARD? Join us at the next RENT post-doctoral writing workshop! The European Council for Small Business and Entrepreneurship (ECSB) is offering a workshop for EARLY CAREER RESEARCHERS, with preference given to those who have finished their PhD within the past 5 years. A paper can be submitted both to the RENT conference and to the workshop; however admission to present a paper at the workshop does not secure its admission to be presented at the conference (ie: a paper in an initial stage of development). On June 25, female entrepreneur and PhD candidate Josette Dijkhuizen, will publicly defend her dissertation, titled: Entrepreneurship, easier said than done…. 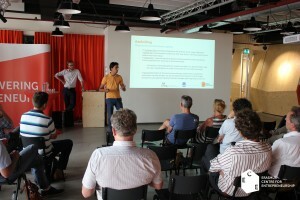 A study on success and well-being among entrepreneurs in The Netherlands. In her dissertation Dijkhuizen investigated how entrepreneurs’ job demands relate to their work-related strain and work engagement, as well as their feelings of subjective success. Among others, her work contributes to the literature firstly by focusing on psychological rather than business outcomes of entrepreneurship, and secondly by contextualizing demands and resources for entrepreneurs, e.g. capturing the general but also the specific factors that are demands and resources in entrepreneurial work. The sixth DARE seminar was an exciting event where the Dutch scholarly field in entrepreneurship research was gathered at Maastricht University. Accompanied by excellent weather and surrounded by the academic ambiance of the School of Business and Economics (SBE) there was a nice and relaxed atmosphere in which a vigorous debate took place on Current topics in Entrepreneurship Research. Four empirical papers were presented, addressing entrepreneurial: finance, well-being, alliances and ambidextrous behavior. Scholars from all over the Dutch network and abroad joined the seminar and participated in the discussions. This DARE event was organized in cooperation with the School of Business and Economics from Maastricht University and the European Council of Small Business (ECSB). The following research was presented and discussed. With great pleasure we invite you to the next DARE-seminar on Current topics in entrepreneurship research. The seminar will be held on May 13th 2015 from 11.00-16.00 hrs at the School of Business and Economics at Maastricht University (Tongersestraat 53, Maastricht). We will discuss several papers that cover the state of the art in entrepreneurship research within the DARE community. Lunch will be included and there is an optional City Walk through beautiful Maastricht. N.B. : the next day is Ascension Day for those who want to extend their stay. On behalf of DARE, we hope to welcome you at this exciting next seminar at beautiful Maastricht.